Gone are the days when the amateur musical circuit could be considered repetitive and stagnant. Brave companies are taking on complex big-budget productions including the likes of Mary Poppins and Chitty Chitty Bang Bang. Less complex on the surface, but still a big challenge, new shows like Saturday Night Fever The Musical are also brightening local stages. Sally Alrich-Smythe reports. Only released to certain societies, Mary Poppins is a favourite, almost guaranteed to rope in large audiences. So far, only (‘pro-am’) companies have staged it. Canberra’s Free Rain Theatre Company enjoyed a successful season, but producer Anne Somes revealed just how much this show is “not for the faint-hearted”. “It’s an enormous undertaking. If you’re looking for a show that has every possible component, Mary Poppins is definitely it! Every component? She’s half-joking, but short of directing animals about the stage (Annie, Oliver! …), she’s not half wrong! There are many overwhelming aspects. The casting demands two exceptionally talented children to play Michael and Jane Banks (and if you’re smart like Free Rain, probably two more as swings). Mary and Bert are huge roles with a depth of character which demands stage presence and dramatic ability, alongside complex singing and dancing. There’s also a bunch of smaller roles which still demand triple-threat status. Simply, real performance ability is a must to be in a show like this one. “It’s not a place where you can hide as a performer at all,” Anne says. Something that may not initially occur to a company considering Mary Poppins are the 200 plus props needed. Anne said it’s the “most ‘proppy’ musical” she has ever been involved in. Then there’s the set, which Free Rain built from scratch. The sets were cleverly designed to pack down so that they may be shipped off anywhere (in two certified containers), giving other companies the opportunity to hire them (via www.freeraintheatre.com). Or do you? I pondered this question out loud when in conversation with Regals Musical Society’s Paul Morrison, who was about to head into production week for their upcoming show, Chitty Chitty Bang Bang. It was his view that a company should always face these kinds of fears and not let the prospect of a “scary tech” scare them away. He talks in reference, of course, to the pressures they’ve encountered with Chitty, the flying car. “I wouldn’t underestimate the ability of an audience to draw themselves into an environment merely using suggestion. You don’t necessarily have to have the car physically fly. You don’t need to have a boom lift to make the car go off the ground… companies should be reassured there are other techniques out there”. 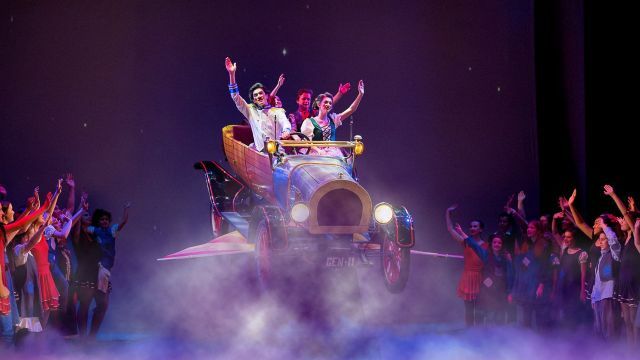 Paul threw a spanner in the works when he gently reminded me the show actually requires five vehicles: the main chitty car (which flies! ), the chitty wreck, the Barren’s car, the Child Catcher’s cage and a motorcycle. Calmly, he told me it’s safe to assume this has been the key budget focus. The most beautiful part of community theatre, the committed membership, steps into the story here, when I am told Regals are lucky enough to have a lot of people with engineering skills. It has been a straight three months, maybe more, of design and construction of these vehicles, with their combined efforts. Paul seems quietly confident Chitty Chitty Bang Bang will not backfire. With a cast combining a nice blend of new faces and old, including some previously ‘retired’ life members, audiences can expect the perfect hallmark event for The Regals’ 70th year. Companies staging it have been given a script that gives them the option of leaving out swearing and tones down the darker scenes. The biggest challenge is casting. “Not only do the leads have to be able to dance well, but they have to be able to tell a very difficult story, sing well, and look the part,” says Madeleine. Describing herself a ‘tough’ director, Madeleine was not willing to accept a cast that was anything short of perfect for the show, and the result “didn’t happen overnight”. In fact, their 19-year-old lead, Adam Goodall as Tony Manero, was originally cast as an understudy. Madeleine simply said that he “wasn’t quite where he needed to be” during the audition process and that she wasn’t prepared to give him the role if she thought she was “setting him up for failure”. The role was left open with the intention of watching how Adam developed over the rehearsal period. Though the preference is obvious, Madeleine tells me the company was willing to source someone and pay them if the level stayed simply where it was at during the first auditions. An absolute credit to Adam Goodall, the university student worked tirelessly before being promoted. Members of the audience were stunned to learn that he had never danced before. It’s not just the role of Tony Manero that might daunt future casting directors. Finding four leads around that age who can sing, dance and act is really a tough feat - especially if your society is plagued with the all to common ‘no-males-at-auditions’ syndrome. Stage Whispers TV’s video shows how the company used a fusion of video and a framed two level scaffolding set with stairs on either side of the stage, which our reviewer Peter Pinne described as “extremely effective”. The top level doubled as the disc jockey platform and the bridge. On the stage two small sets for the family home were wheeled on from either side. The company did not build a coloured disco floor, but used lights for the nightclub scenes. There was praise too from Peter Pinne for the 70s wardrobe with lots of hip-hugging flares and platform shoes. Reflecting on the casting process in particular, Madeleine let out an exaggerated sigh. Slightly bemused I asked her what she was thinking about. Sitting in the car on her way to the theatre, in preparation for the final weekend of their Saturday Night Fever season (extended for an extra week due to ticket demand) she used the same words Anne Somes had said about Poppins only hours earlier, “it’s really not a show for the faint hearted”. 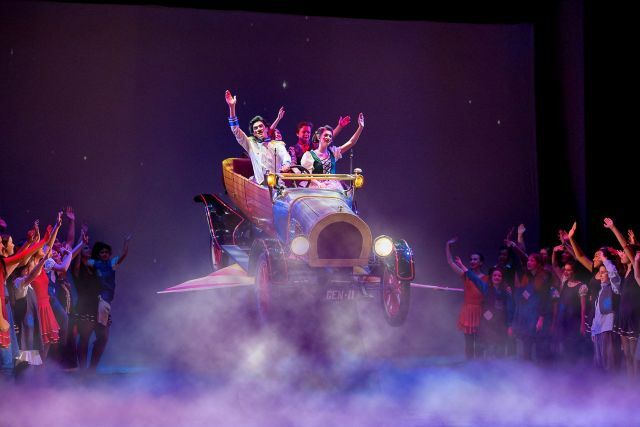 Images: Chitty flying at Pelican Productions, Adelaide (Photographer: Oliver Toth); Mary Poppins at Free Rain; Chitty at The Regals (Andrew Croucher Photography) and Saturday Night Fever at Redcliffe. Originaly published in the May / June 2015 edition of Stage Whispers.